Executives and IT managers are accountable for violating customer protection and privacy rules. Under the Health Insurance Portability and Accountability Act (HIPAA) allows fines up to $250,000 and 10 years for each violation of patient health information privacy rules. In addition the Gramm-Leach-Bliley Act imposes penalties of up to $100,000 per violation for financial institutions that fail to protect customer information. Can I schedule a specific time for my drives to be cleaned or disposed? Yes. After receiving your order a time will be selected during business hours to meet you at your location. Are there any hidden transportation costs or membership fees? No! Our on site services are included in the price given to you at checkout. There are no membership fees or hidden cost for our services. How do I know my material has been destroyed? 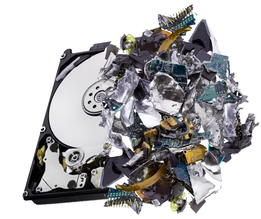 Erase It Clean™ is an on-site service, customers can watch the drives be destroyed and wiped at any time. Upon completion of the destruction process, Erase It Clean™ will issue a Certificate confirming the status of your drives and/or devices.